I contributed a variety of features to the vim-pandoc-syntax plugin, a plugin that provides Pandoc-flavored markdown syntax highlighting and concealment to vim. 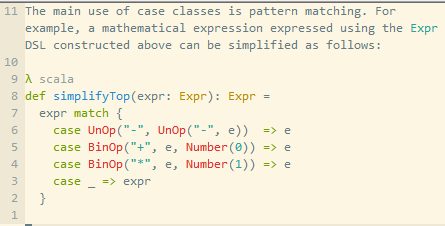 Concealments in vim are a relatively new feature which allow a different in-editor appearance for certain patterns. For example, the underscores that are used to italicize text can be concealed to decrease clutter. I started out by fixing the italic pattern, which would previously get tripped up by intra-word underscores such as in ALL_BUILD. Then I added concealment of codeblock delimiters, so that the starting delimiter for codeblocks gets replaced with a λ and the end delimiter gets concealed altogether. I also added abbreviation highlighting and concealment, then I added strong-emphasis highlighting and concealment. I fixed a bug in the definition block pattern that was causing cascading issues with other patterns.